"We always called it the "Busy Cake"...too many things going on with it! Crushed maraschino cherries can be found in the ice cream sundae department at the grocery store. If you can't find them, get regular maraschino cherries and chop." 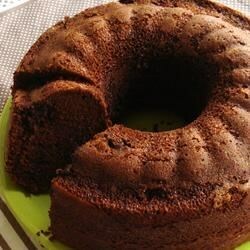 In a large bowl, mix flour, sugar, cocoa, baking powder, soda and salt. Add eggs, coffee, milk, oil and vanilla. Beat until smooth (batter will be thin). Fold in cherries and chocolate chips. Pour batter into 9x13 inch pan. Bake at 350 degrees F (175 degrees C) for 35 minutes or until toothpick inserted into middle comes out clean. It's best to leave it in the pan, because the chips and the cherries sort of sink to the bottom and solidify and will stick big time! Frost with white buttercream. For the frosting: In a large bowl, combine butter, confectioners sugar, 1/2 teaspoon salt and vanilla. Cream with an electric mixer. Add milk by the tablespoon until frosting is smooth.